This Ltd F-415FM Bass is part of ESP's most popular line, the Standard Series. A slick See-Thru Black finish, with a formidable shape, 24 frets and a mahogany body. The F-415FM is not only aesthetically intimidating, but also in sound. 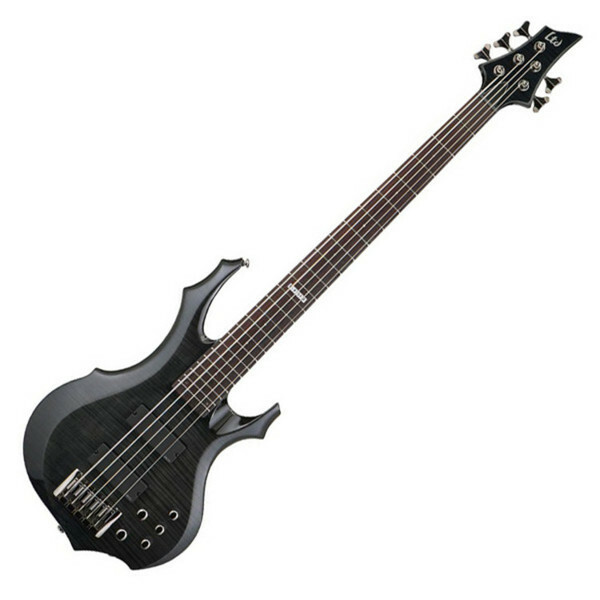 This bass is versatile to accomodate many styles, but ideal for metal and heavy rock. The distinctive look of the F-415FM is accentuated by striking black nickel hardware, high-quality bridge and tailpiece, Grover tuners and rosewood fingerboard. The F-415FM combines a professional mahogany body with a 5 piece maple and rosewood neck-thru construction neck that's just as specialised but easy to play due to it's extra thin U-neck contour. This, combined with the extra-jumbo frets, accommodates the fast playing style that ESP basses are celebrated for. ESP devised their Ltd line of basses to be accessible to all musicians who want their dream guitar at an affordable price. Their F-415FM bass guitar is no exception. Originally designed as professional gigging instruments available off the shelf, the Ltd series models have grown in popularity since the late 90's and the range has expanded to include nine models, including this critically-acclaimed Standard Series bass. The Ltd line also includes signature models from some of the world's greatest metal bassists including Henkka T Blacksmith of Children of Bodom and Tom Araya of Slayer. ESP guitars are renowned for the quality of their construction and it's a well earned distinction, as this quality is present in all their guitars and basses, from their top end signature models through to the more affordable LTD models. ESP and LTD Guitars and Basses feature high quality hardware and design features that are indicative of a company that has spent 36 years designing some of music's most brutal, hard wearing and road worthy instruments.